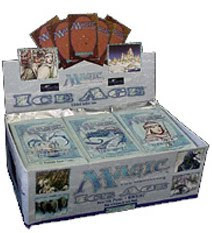 Ice Age was the first standalone expansion to Magic: The Gathering ever published. Released in 1995 It was branded as a separate game if wished, or to be integrated into the core set and subsequent expansions. It was also the first official block ever published, although it only had one expansion at the time: Alliances. For purposes of block constructed play the block was known as ALICE (Alliances/Ice Age) and then months later on the expansion Homelands was ret-conned into the block to provide the third set. This was finally rectified in 2005 with the publication of Coldsnap, the third official expansion of the Ice Age block, deposing Homelands in the process. Because of the bizarre out of order set publishing, block tournaments featuring all the sets were never officially recorded, although a number of ALICE tournaments were. Since then however a number of cards have been banned from the block*, not to mention an entire set was swapped in, changing the meta-game considerably. Coldsnap aimed to fill gaps that ALICE hadn't initially filled for deck strategies. It offered a number of powerful cards to the block that WOTC deemed necessary. With this expanded card pool I'll share a couple of these updated Ice Age block decks in this article. IAC Sligh conforms to the same standards of any other sligh deck: cheap creatures backed by burn and a fast curve. It attempts to beat down quickly and finish with a burn spell or Balduvian Horde. Death Spark is an incredibly fun card to use as it's essentially a point of damage every time a creature dies and recurs multiple times a game. Skred is helpful for dealing with large creatures that serve as problematic for the smaller faster creatures that sligh uses. In the sideboard Sligh can bring in landkill for problem cards like Kjeldoran Outpost or Scrying Sheets, Pyroblast for forcing spells into play against permission, Anarchy to deal with problematic permanents like Circle of Protection: Red, and Pyrokenesis for creature matchups. Another potent deck for this format and a strong counter to Sligh, is the Counterpost deck. Variants of this deck existed in the standard metagame back in the late 90's combining the token generating power of Kjeldoran Outpost with permission spells and board sweepers. Once enough land was established and enemy creatures were killed, the Counterpost player could ride a wave of soldier tokens to victory. Counterpost featured a clean card drawing/library manipulation combination with Portent, Brainstorm and Scrying Sheets. It also benefitted from one of the most powerful permission spells ever creatred: Force of Will. The idea is to stall with Phyrexian Ironfoots until enough land is reached to Sunscour the battlefield. Once that occurs the Counterpost player rides counterspells to protect his outpost and beats down with solider tokens. Adarkar Valkyrie can help accelerate the process. The Sideboard boasts additional counter-magic, COP: Black to battle the popular Necropotence decks that were rampant in the format, and additional disenchants to deal with enemy Ironfoots. Exile dealt with creature decks nicely. That is our first introduction to Ice Age Block decks featuring Coldsnap cards. In another article I'll explore additional decks from this format, including a deck centered around one of the most famous (notorious?) cards in all of Magic: Necropotence. * Zuran Orb and Thawing Glaciers were non-ante cards that were formally banned in Ice Age block constructed long after the ALICE block season had taken place. 0 Response to "Block Constructed Magic: Ice Age Block"